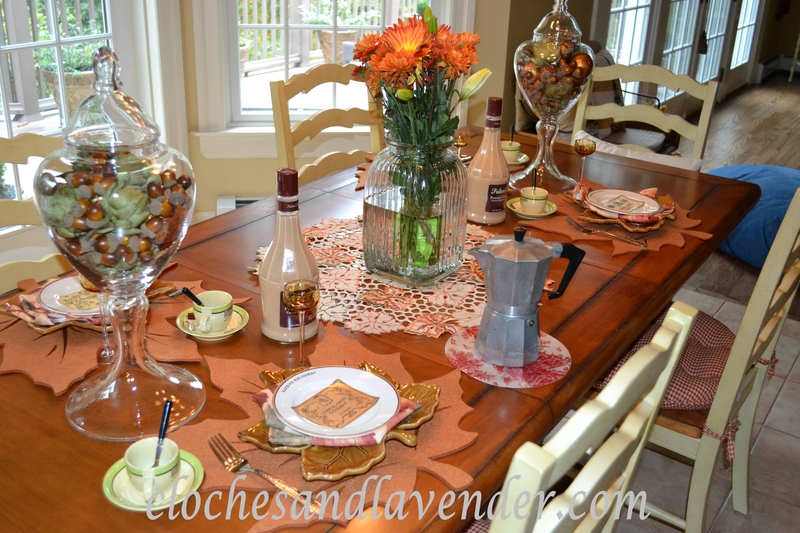 The fall season is full swing it seems, and I thought that I would share one of my fall table settings with you today. Some friends are going to stop by today with some nice Italian pastry to go along with my nice pumpkin spice cordial and homemade espresso. 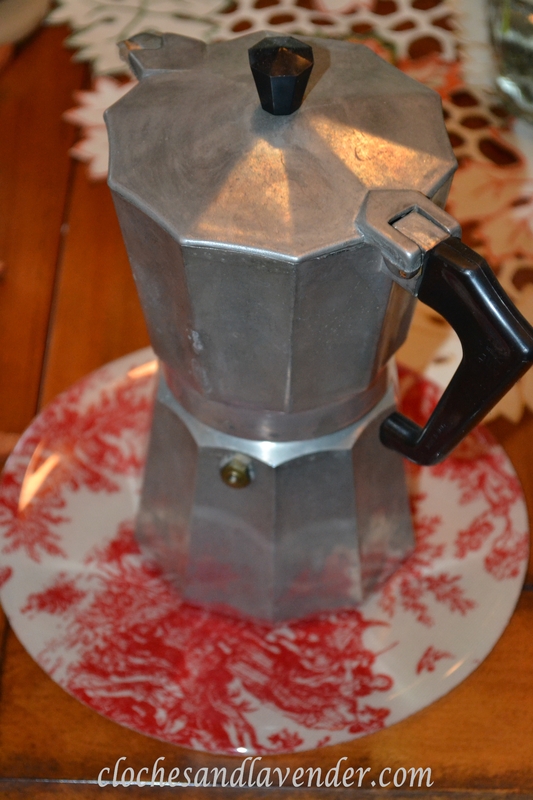 The chill in the air makes me want to bring out my old espresso pots and offer something warm and delicious to take the off the chill while enjoying some relaxing time and conversation. These cordial glasses are some of my favorites (I have a thing for cordial glasses LOL). They’re an amber color, which is perfect for fall. A few years ago I found them at the Newport Armory antique mall while in Newport, RI for a visit. It was a wonderful long weekend of antiquing and eating some wonderful local dishes! The French label plates (each one is different) I bought a while back from Williams Sonoma and the leaf plates, which took me forever to find, are from Replacements.com. 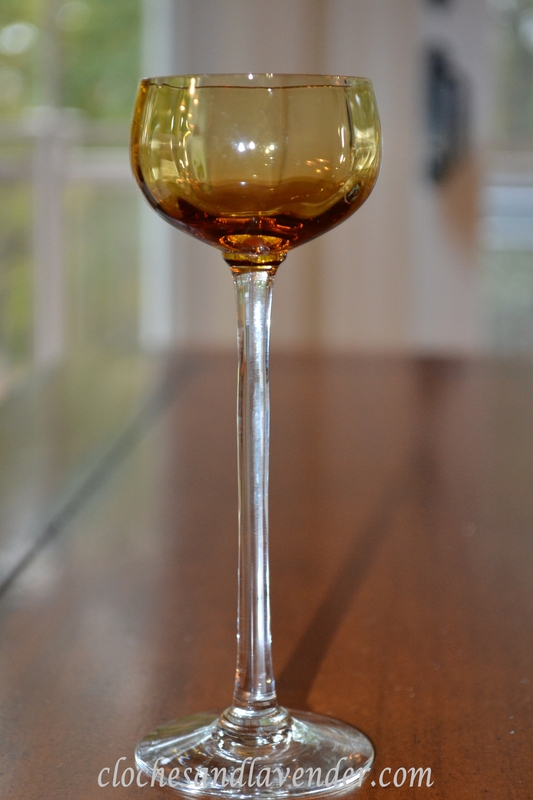 They are a beautiful amber color and help bring out the amber in the cordial glasses. The placemats are a purchase from Bed Bath & Beyond for $2 each. Yes, $2, how great was that find. I hope you are taking time to enjoy this glorious time of year with your friends and family as well. Looks and sounds yummy! Your plates, cordials and flowers are gorgeous! I love the apothecary jars too! 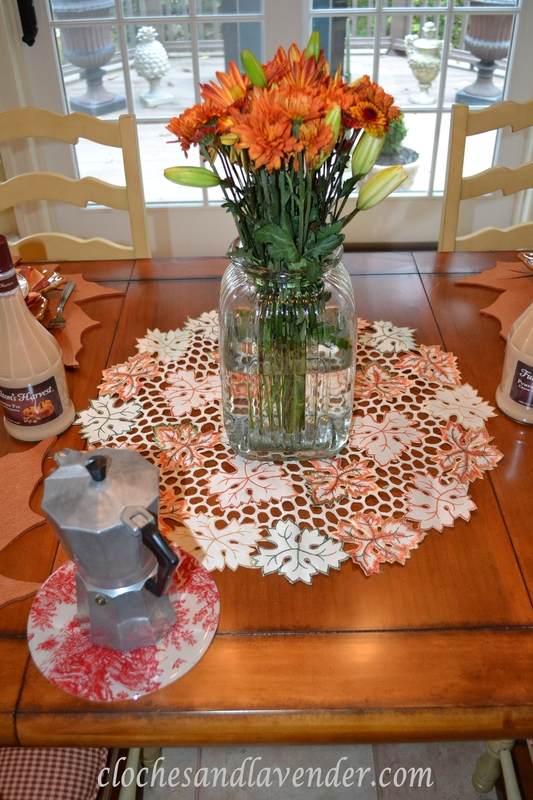 You have me dreaming of an Espresso in this lovely Fall setting! What a pretty table! Love those dishes and the apothecary jars.Sound like a fun time! What a delightful table setting! Anyone would love to be a guest at this table. I saw your link on “A Delightsome Life”. Thank you so much I hope you will follow Cloches and Lavender. 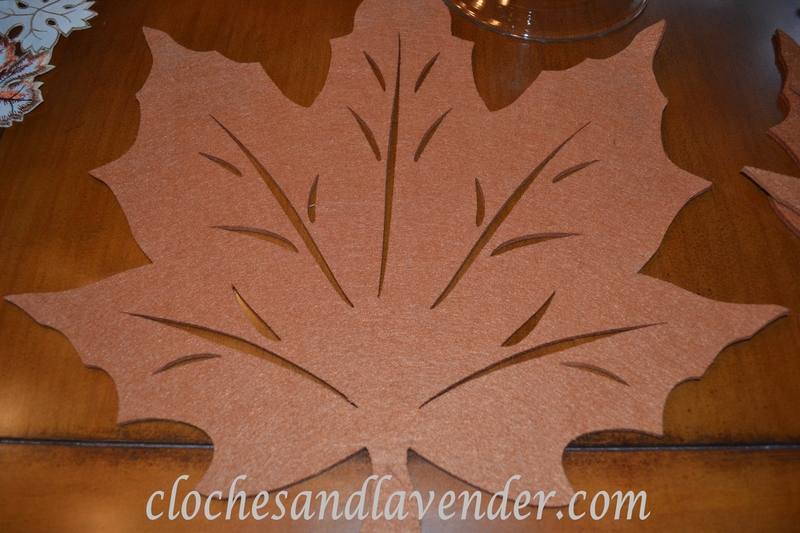 Your table looks splendid for autumn with the leaf placemats and chargers. 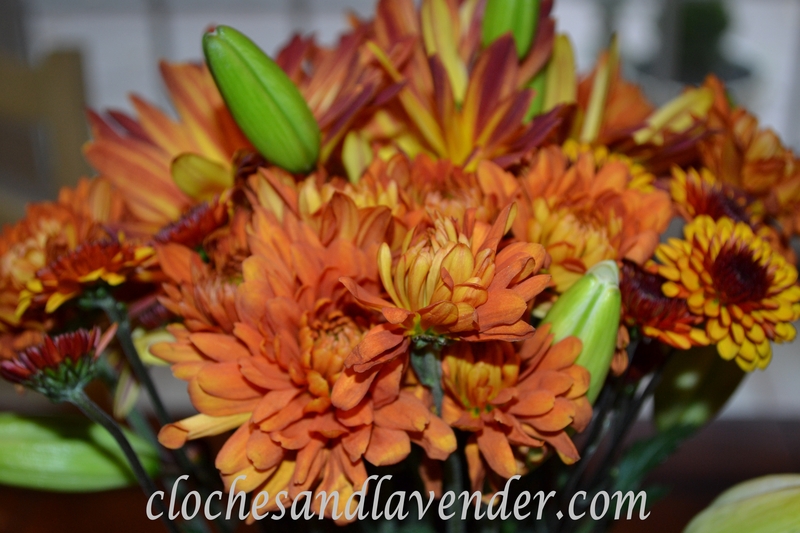 The bouquet of fall colours matches perfectly. Your cordial glasses are beautiful! The amber color is so very pretty. Hope you had a lovely time with your friends. Thanks for the visit. We had a great time, a lot of laughs. I still can’t believe the price. Thank you so much. We had a lovely and relaxing time. Thank you for the visit. Your tablescape is gorgeous! 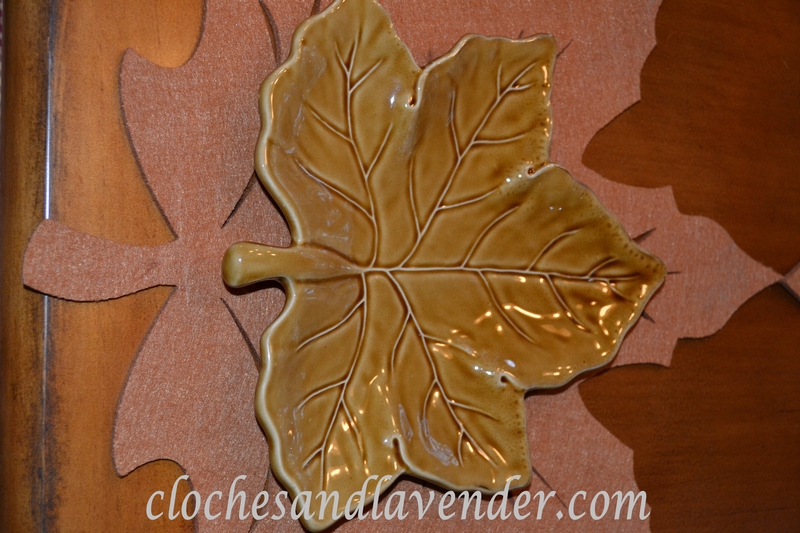 Those amber colored glasses are very pretty as well as your leaf plates. Your cordials are lovely. Your whole tablescape is wonderful! Perfect for the season. Love the leaf plates! Happy Tea Day! Thank you so much. Happy tea Day to you too. Your table looks beautiful – so autumnal. I love the colors of fall. I purchased that same pumpkin cordial; it’s delicious, isn’t it? Thank you so much and yes that cordial is so yummy. Beautiful fall table. Those plates from Williams Sonoma are quite lovely. The whole table is delightful. Thank you so much for your lovely commet. 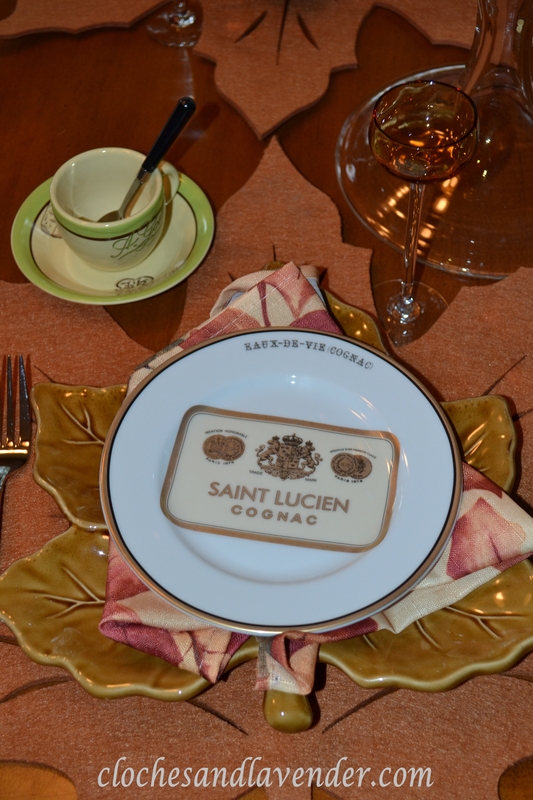 Love your cordial glasses and leaf plates. Everything looks lovely and festive for this time year. The red toile trivet caught my eye too. Thank you for sharing and have a beautiful week. Thank you for you lovely comment. You have a great week too. Very nice and I love your cordial glasses! What beautiful amber glass! Thank you so much, as soon as I saw them I grabbed them. I completely understand!! I have this uncontrollable draw to both amber and ruby colored glass! 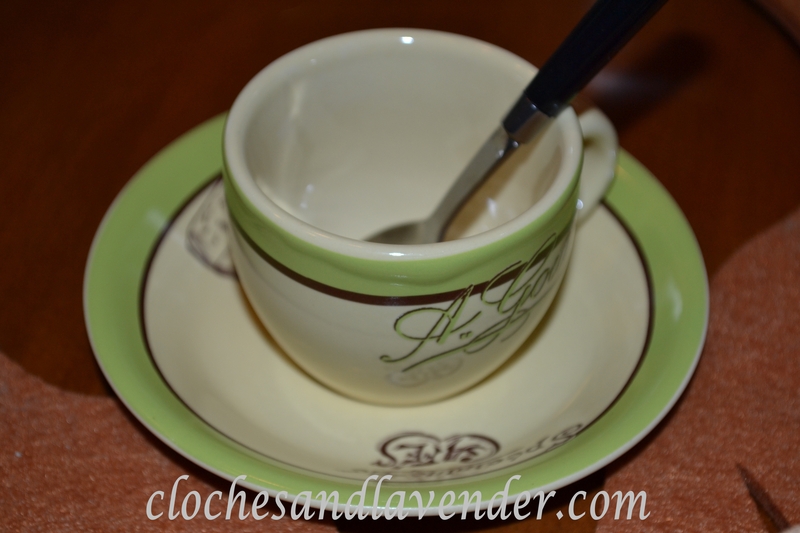 Love your espresso cups, Cynthia! You are making me hungry thinking of some pastries and a nice cup of espresso. The cordial glasses are beautiful. We had a good time. Those are my favorite in my collection. 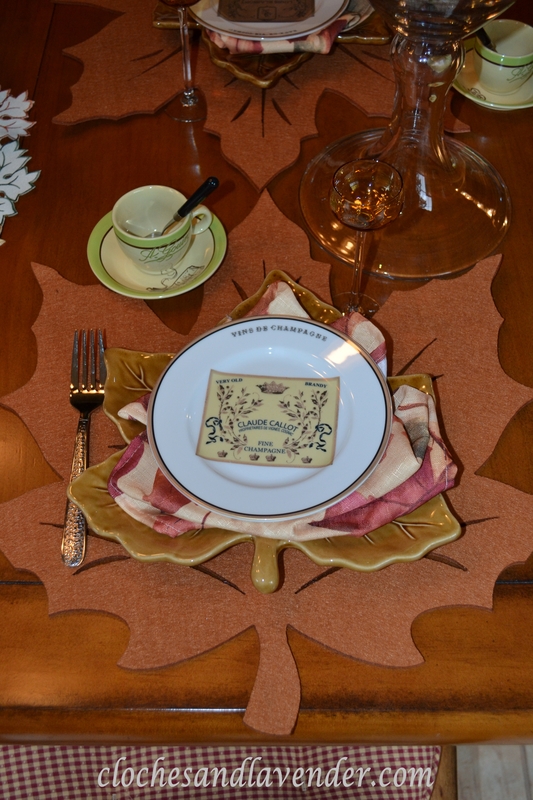 What a beautiful fall table setting! Thanx for sharing at THT!